Purchase DODGE NEON keyless entry remotes from us and save up to 75% off dealership prices on key fobs! Lost or broken keyless remote control or transponder key for your Neon? Free, unlimited tech support and free instructions on how to program your Dodge Neon remote are included with the purchase. 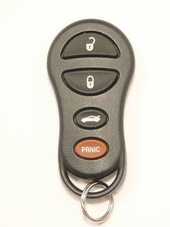 Dodge Neon remote controls, key fobs can be replaced at a fraction of a dealership cost.